Catriona Campbell (Glasgow School of Art, 1957 to 1961). 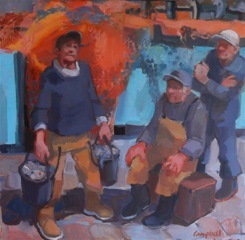 Catriona holds the Somerville Shanks Prize for Portraiture, has exhibited in the Royal Scottish Academy, the Royal Glasgow Institute of Fine Art and the Royal Society of Portrait Painters (London). 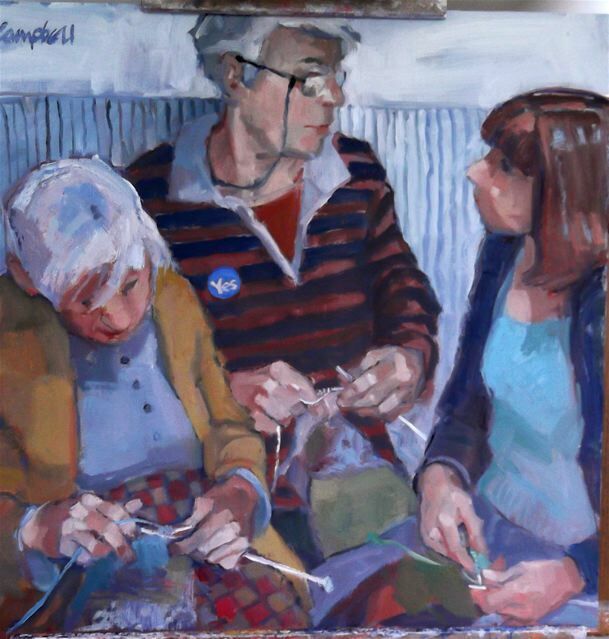 She is a professional member of the Scottish Society of Women Artists (now Visual Arts Scotland), the Paisley Art Institute, and the Aberdeen Artists' Society. She has taught art at primary and secondary levels, and her paintings can be found in private and public collections in the British Isles, France, Spain, Canada, America, Australia and Hong Kong. Catriona says, "I am involved because I want Scotland to be independent. The Map was initially my idea, cast into the ring without any forethought (or afterthought for that matter!) Amazingly it was picked up enthusiastically by a lot of keen knitters, we made a full- size map, divided it into 36 rectangles and the whole thing took off. I felt that the least I could do was to contribute a small piece of the Atlantic." 'Casting off', oil on board.